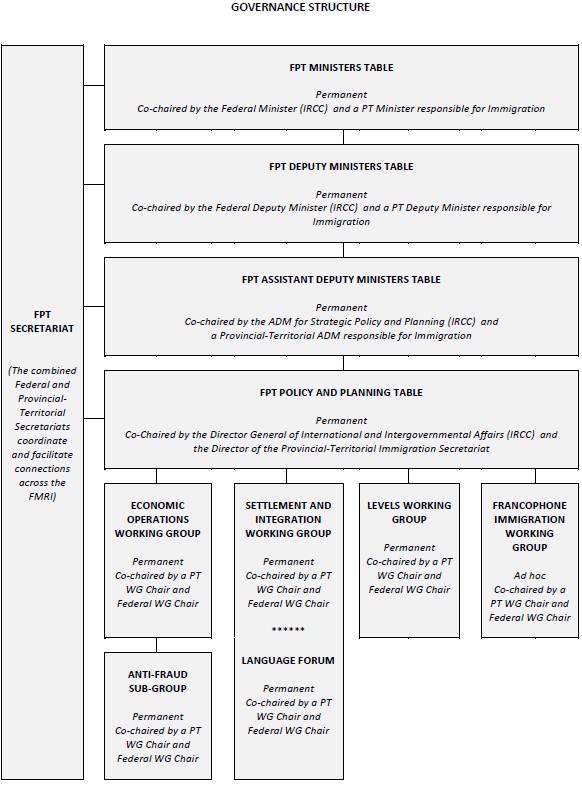 The Forum of Ministers Responsible for Immigration (FMRI) has three decision-making tables: Ministerial, Deputy Ministerial, and Assistant Deputy Ministerial. The members of these tables make decisions that establish and shape shared strategic objectives and related outcomes for immigration policies and programs within Canada. Each of these tables are permanent, and all major decisions and products developed by these tables are determined by member jurisdictions. Note: Quebec is an observer / non-member at each of the aforementioned tables by choice. The FMRI has a number of components that support the decision-making tables, and carry-out research, analysis, and coordination functions. These support and coordination components include a Policy and Planning Table and a variable number of permanent and project-specific working groups whose activities advance multilateral Ministerial objectives such as immigration levels planning, economic immigration, and the settlement and integration of newcomers. Note: Quebec is an observer / non-member within each of the aforementioned support components by choice. The Provincial-Territorial (PT) Secretariat facilitates multilateral collaboration and communication among PT ministries responsible for immigration, provides support to all the immigration working groups and tables, as well as strategic policy analysis and development related to immigration issues. The PT Secretariat also provides the PT co-chair of the FMRI direct support in fulfilling its co-chair role. The PT co-chair for 2016-2019 is Manitoba.